Runs for Cookies: What happened to my fitness?! I headed out at around 10:30 this morning, and I immediately wished I'd gone earlier. It was 73 degrees with 70% humidity! That's not bad at all when you compare to it summer; but, for October in Michigan, that wasn't very comfortable running weather. I did the warm up at a nice, easy pace, and then as soon as I started the race pace miles, I knew I was in for a real workout. It felt tough! I held a 9:30-ish pace, and even just half a mile in, I started thinking of excuses that I could use to stop early. Stephanie had just nailed this workout a couple of days ago, so I kept that in mind as I was running. I certainly don't want to let her down. 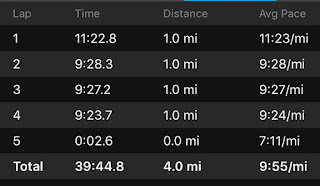 It was just kind of amazing that six months ago, my race pace runs were at a 7:55 pace; and now, a 9:30 pace feels just as hard as that 7:55 did then. It was hard, but I pushed myself to get in all three miles at 9:30. (I totally forgot about doing a cool down mile). 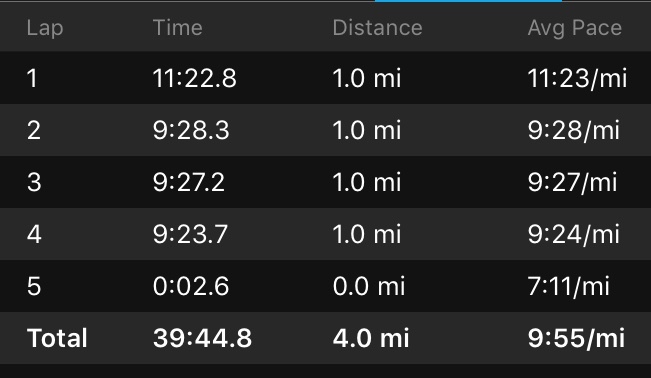 Even though it was tough, it felt kind of nice to have a pace goal today. I've been running without purpose for about six months, and having a purpose to this workout was nice. Today, we have someone coming to look at our furnace. It needs to be replaced :( I had NO idea just how expensive furnaces are! Ours was new with our house back in 2003, so it's now 13 years old. I'm sure it was a very cheap model (we have a manufactured home, and I didn't know better at the time to upgrade the appliances), and I'm actually surprised it lasted as long as it did. Thankfully, my brother knows a guy who installs furnaces, so he will give us a good deal on the the labor; but the furnace itself is a necessary, yet really boring, expense. (By "boring", I just mean that it's not fun to buy. Spending money on a vacation or a new car or something is fun; a furnace just isn't exciting.) It seems like every time we finally start getting some money saved in an emergency fund, something goes wrong (like the water heater recently) and we have to spend it! We've been having problems with the furnace for a few years now, so it will actually be nice to not have to worry about it. Rumor has it that we're going to have a very harsh, cold winter, so I would hate to have to deal with this a few months down the road! Better to get it done now. Speaking of a harsh winter, I really need to starting thinking about a new treadmill. The timing is terrible, because of the furnace issue, but my treadmill is going to die any day. I haven't even used it in a long time because it's rickety and it's had issues with slowing the speed instantly while I'm running, which is scary. I've been looking online for one, but it's totally overwhelming! Do any of you have a treadmill that you absolutely love and recommend? I want one that is good quality and will last a long time. I don't need all the bells and whistles of TV screens, internet, etc. Just regular old speed and incline (and, preferably, a quiet motor). I appreciate any suggestions! We have a TRUE brand treadmill...Love it! It's perfect for both myself and my hubby---has incline up to 12 percent and does the trick when it's too hot to go outside (we live in AZ) or we just want a treadmill workout! I'd do a little research on unbiased ratings, like by Consumer Reports. If you can look up what issues they had reviews for treadmills, you could then find those issues at your public library to read them. Then use that information to look for recommended models on Craigslist. I bet you could find a crazy good deal on one second hand. After your recommendation I invested in the book and six months later I have smashed PBs at every event I've attempted: 5k, 10k, 10m and half marathon! So thank you for the recommendation!! Actually, the 10K plan that I wrote is 80/20 :) I don't regret taking it easy during the summer. I had trained SO hard for my 10K, it was really nice to take a break! I think I'll be ready to train hard again in a few months. A huge congrats on your PR's! Isn't it amazing how slowing down your easy runs can make you so much faster? I have a Landice TM and love it! I actually walking on it right now. It's not cheap, but is reliable and usually ranks well in Consumers Reports. I would 2nd the recommendation to check out True brand treadmills. I was shopping with the exact same concerns. I wanted good quality, good motor, comfortable running deck, long lasting, and wasn't interested in all the bells and whistles. True fit the bill. I've been running on my treadmill for about a year now and am very happy with it. I got a Spirit Fitness XT485 in February 2016 that I'm pretty happy with. Previously I'd had a NordicTrac for 10+ years that eventually fell apart. I can't remember what I paid for it, but I was generally looking for under $2000. I had also been looking for brands like True, Spirit, and Landice, but I discovered that when I wanted to find stores with specific brand names to try out and run on, very few stores had the ones I wanted in stock. I never found a place locally with a True to try. The Landices were much more expensive, and I didn't find them worth it. I'm not the type to worry about making sure I try *everything*, so since the Spirit seemed fine and was in my price range, I went with that. Make sure that you not only try out the treadmill for running, but thing about what else you need when you run. Is the water bottle holder in a good place? If you need a shelf for a book/device, is there one? If you watch a TV, can you see it over the console? I didn't want a lot of fancy electronic options, but there was a treadmill I might have considered if the stupid console didn't have some huge thing sticking up (not a TV) that would have blocked my TV view! Little things can end up being a pain if you don't think of them ahead of time. I have a Proform treadmill that is just over 10 years old now and still going strong (knock on wood). I would definitely buy another if mine crapped out! I've heard that True treadmills are awesome for runners. I did a ton of research and decided on a Horizon T101 for myself....and then I watched and waited until I found a good deal on Craigslist. It's perfect for me, but I only walk and do intervals, so I didn't need a $2000 machine. A serious runner needs a much more expensive machine.....but they can be found on Craigslist, too, if you're patient and watch for them!